confidence. Uncover how to take your practice performance to meets! You (or your athlete) might be the most skilled gymnast in the gym and train harder or longer than anyone else, but if self-doubt enters your mind prior to or during competition, you simply will not reach your true potential in gymnastics. If you are ready to improve your mental toughness and perform with ultimate self-confidence in competition, we have a program that will do just that. Your gymnastics mental game experts Wendy Bruce, MGCP (former gymnastics Olympian) and Dr. Patrick Cohn (over 24 years of experience as a mental game expert) want to share with you powerful mental strategies to help you perform your best in competition. When I (Wendy Bruce) trained to become an Olympic gymnast in the 1970’s, 80’s, and 90’s, coaches understood that gymnasts needed to be strong. We would run for our cardio and endurance. We would do physical conditioning for strength. And it worked; on the outside we were strong and tough. Most of the coaching at that time focused on training the body, but unfortunately left out the most important part: the mental game of gymnastics. 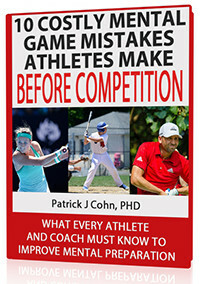 I did not have the benefit of sports psychology when I was competing, but I wish I did. The field was not as well known or accepted as it is today. As a young gymnast, I didn’t understand the importance the mind played in my gymnastics career. I was clueless about the problems caused by my high expectations. I did not know how to compete with total confidence. I did not know why I started to envision myself falling. And why I felt like failure when I made mistakes at competitions. What I lacked was a strong mind. On the surface, I acted as if I was unbreakable, but underneath, on the inside, I was a gymnast with fears, doubts, and a lack of self-confidence. Early in my career, I didn’t know that mental skills could be learned or that I even needed to learn them. Looking back on my career, the higher levels I achieved as a gymnast, the more I needed to be mentally tough. I was able to be a good gymnast (and compete in the Olympics), but if I wanted to be a great gymnast (and medal in the Olympics), I needed mental toughness. The year I competed at the 1992 Olympics was the most stressful year of my gymnastics career. In every competition in 1992, I choked. In the first meet of the year I fell on beam. This started a fast downward spiral into a world of doubt, fear, and low confidence. I started to wonder what would happen if I fell in the Olympic Trials and didn’t make the Olympic Team. I saw myself falling on my routines. I even choreographed a fall into my routine so I wouldn’t get upset in the competition when I did fall. I fell so much that couldn’t imagine hitting my routine. It was not a surprise that I fell on beam at the Olympic Trials, but fortunately my other events were strong enough to put me in the top six and I did make the team. She taught me mental choreography and talked to me about trusting in my ability. She gave me the mental tools I needed. With those tools I learned that I was able to perform my routines with confidence, especially beam. And because of the minimal mental toughness skills I learned I was able to help my team win a Bronze medal. Mental training, had I done more of it in my career, could have helped me much more. I could have saved myself from a lot of unnecessary stress and anxiety. I learned the mental game is such an important part of gymnastics and it needs to be trained just as seriously as physical gymnastics skills. That’s why Dr. Patrick Cohn and I have created “The Confident Gymnast: Mental Game Strategies for Peak Performance.” Our goal is to help you and other gymnasts and coaches develop the mental game skills to be successful in competitive gymnastics. CD and Workbook Shipped To You! We will ship the CDs and Workbook to you! Digital Download: No Shipping Cost! Perfect for customers who want immediate download! Wendy Bruce won a team bronze medal in Barcelona, Spain during the 1992 Olympics, after finishing 6th at the US Olympic trials. Wendy also competed in five U.S. national championships. She was also a World team member in 1989 when her team placed fourth in Stuttgart, Germany. Wendy was inducted into the USA Gymnastics Hall of Fame in 2010 and the Broward County Sports Hall of Fame in 2011. Wendy has been a gymnastics coach for 20 years. She is also a MGCP certified mental game coach to gymnasts. Today she helps gymnasts develop mental toughness for a competitive edge. As the founder of Peak Performance Sports in Orlando, Florida, Dr. Patrick J. Cohn is dedicated to instilling confidence and composure; and teaching effective mental game skills using sports psychology strategies. Having earned his doctoral degree in Education specializing in Applied Sports Psychology, Dr. Cohn has extensively studied and interviewed hundreds of athletes to develop strategies to enter “the zone” faster and stay there longer. Experts in the field of sports psychology regard him as the leading authority for entering the zone and pre-performance routines. Dr. Cohn has been a sports psychology coach to athletes, teams, and coaches worldwide from a variety of sport backgrounds for nearly 15 years. He has consulted with the likes of the Miami Dolphins, A.J. Allmendinger, Brian Watts, and J.L. Lewis. His experience as an athlete, researcher, and sports psychology coach has helped hundreds of athletes as well as athletic coaches, trainers, and therapists identify the mental obstacles that prohibit peak performance. We’re on a mission to teach you proven and effective mental game strategies so you can overcome any mental block, take your practice game to competition, and boost your confidence in gymnastics. We won’t waste your time by boring you or your athlete with psychobabble! We provide simple, proven mental game strategies to help you perform at your peak—when it matters! The best part is that you too, can tap into our expertise and experience the coaching that helped athletes improve their mental game over the past two decades, so you can perform your best in practice and competition! You’ll learn the top eight mental game lessons for gymnasts – the same lessons we teach our personal coaching students, who pay thousands of dollars for our strategies. We’ve made sure that our lessons are easy and effortless for you to improve your mental game. “The Confident Gymnast: Mental Game Strategies for Peak Performance” CD and Workbook program is ideal for any competitive gymnast. In addition, coaches and parents would also be wise to teach the strategies we provide in “The Confident Gymnast” to their athletes. Gymnasts: Get the mental edge by learning how to take control of your confidence, mentally prepare for competition, and perform with composure under pressure. Coaches: Boost your gymnast’s confidence using simple, proven mental strategies. Parents: Help boost your athlete’s performance. Don’t let their mind hold them back any longer. What’s Included In “The Confident Gymnast” Program? “The Confident Gymnast” is a complete brain dump of the TOP eight mental training sessions we teach our gymnasts to help them boost their mental game and improve consistency – from how to mentally prepare for competition to performing under pressure to building unstoppable confidence. 4 CDs including 8 confidence-boosting sessions on audio. Each 25-30 minute session includes one mental training lesson to help you improve confidence, focus, composure, and develop focused routines. One workbook to guide you through my mental toughness sessions and to overcome mental game roadblocks. 7 Free Bonuses Worth $170! Are you doing everything you can to help your gymnast succeed? Parents: test how well you support your athlete’s mental game. See if you pass the parenting test! (Bonus Value= $20). Help your gymnast perform with confidence and simplicity, and have fun! Learn the top suggestions for parents to follow prior to competition. (Bonus Value= $20). Learn how to create a positive post-meet experience for your gymnasts! What you say to your athlete after competition is critical to his or her future confidence and success. (Bonus Value= $20). Gymnasts learn strategies to assess your performance after competition so you can have greater confidence! Perfect for gymnasts that are perfectionists or self-critical after competition. (Bonus Value= $30). Parents: Learn how to help your gymnast with the top mental game strategies we teach in “The Confident Gymnast” Workbook and Cd Program! Learn how to support your athlete’s mental game. (Bonus Value= $30). Learn tactics for helping your gymnast buy into mental training! If you are unsure how to introduce mental training to your gymnast, this eBook is perfect for you. (Bonus Value= $30). Value of All Bonuses = $170! Instantly Download Your Bonuses Immediately After Placing Your Order! “The Confident Gymnast” 4-CD and Workbook program is the most comprehensive mental game program we’ve offered to the public. We’re virtually giving away all our mental game secrets for the incredibly low price of only $297.00 including the free bonuses! Of course, we’re happy if you instead choose to enroll in our one-on-one mental coaching program! However, our one-on-one personal coaching program starts at $600 for one month of coaching! If You Don’t Get Results, We’ll Buy It Back! We stand by our work 100% – we never want you to feel like buying the “The Confident Gymnast” CD and Workbook program is a gamble. Embrace our strategies and apply it 100% to your performance. If you’re not happy, for ANY reason in the next 30 days, just contact us by email or phone, return the CDs and workbook and we will buy it back. You’ll get a courteous refund of every penny! Does that sound fair? Thank you for taking the time to read about the “The Confident Gymnast” Audio CD and Workbook Program – the best value to rocket your confidence, focus, and composure to new heights. Please contact us if you have any questions!